It’s Restaurant Week in Hong Kong and for the first time, I went online and checked the list of participating restaurants. DW and I went to check out Chez Patrick restaurant in Wan Chai, which moved here from it’s previous location in Soho, where Chicha now stands. I’ve been meaning to check it out, and a 3-course set lunch at HK$ 248 was a good motivation to do so! This event is a good way for some restaurants to gain some extra coverage, perhaps attract some clientele that would have not considered dining there before. Chez Patrick is not one of those restaurants, as chef Patrick Goubier has built a very solid reputation for quality ingredients and excellent French fare, as seen by the success of his restaurant and Chez Patrick Delis. It does give diners a chance to sample some of his cooking at a reasonable price (the 3-course dinner is HK$438) – if this sounds enticing to you, then go and book your table now, as restaurant week ends this Sunday 3rd March! 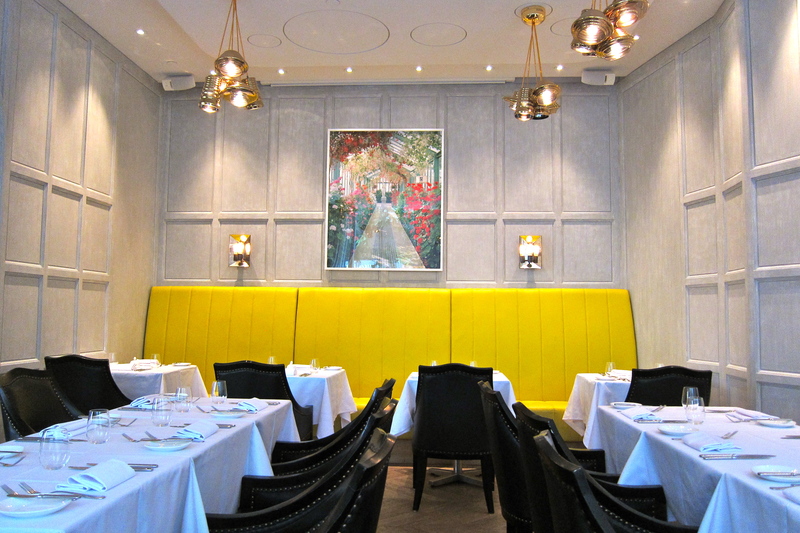 His Wan Chai restaurant is tastefully decorated, ash grey wood paneled walls, golden lighting fixtures and a little splash of colour (love that bright yellow banquette!) It’s warm, inviting, and cozy. 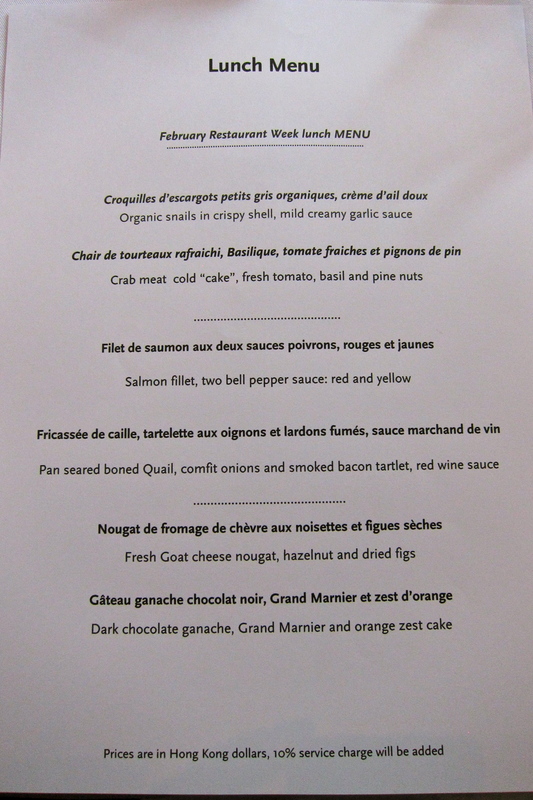 The Restaurant Week menu covers some French favourites (escargot, quail) a little of the norm (crab ‘cakes’, salmon fillet), and something a bit different (fresh goats cheese nougat). 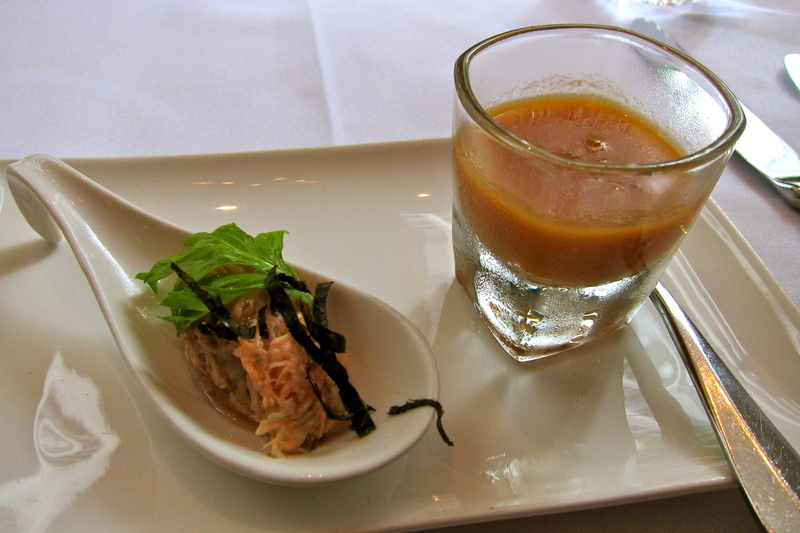 It was easy to make our choices, and while we were waiting for our starters, we were served an amuse bouche. As we were about to start, Chef Patrick himself personally came to our table to greet us. He said hello, took our hands and kissed them (! 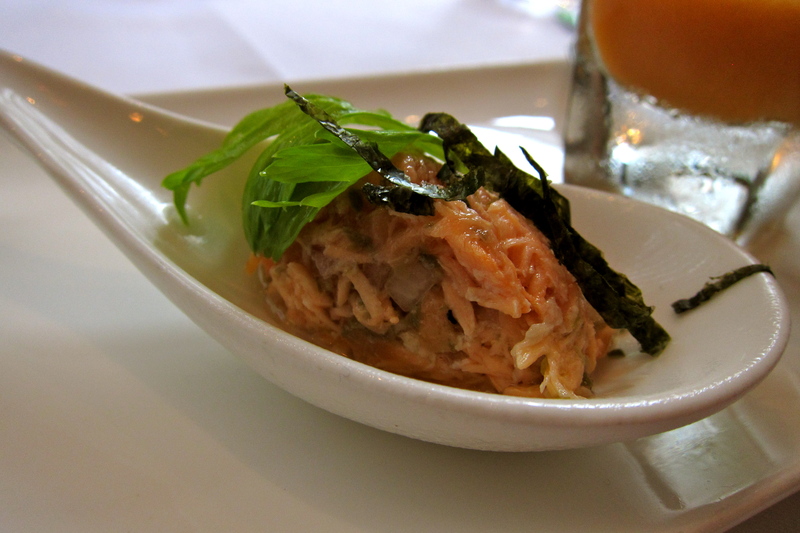 ), thanked us for visiting his restaurant, and then proceeded to explain the reasoning behind his amuse bouche. For the chilled gazpacho, he described how he soaks cherries in kirsch overnight as part of his base stock, and adds a touch of lavender. “The goal is to refresh your palate” he says – and refreshing it was, and particularly welcomed on another uncharacteristically warm February day. The salmon rillette is chilled and mixed with shallots, capers and lemon juice – a really wonderful combination that can never go wrong. 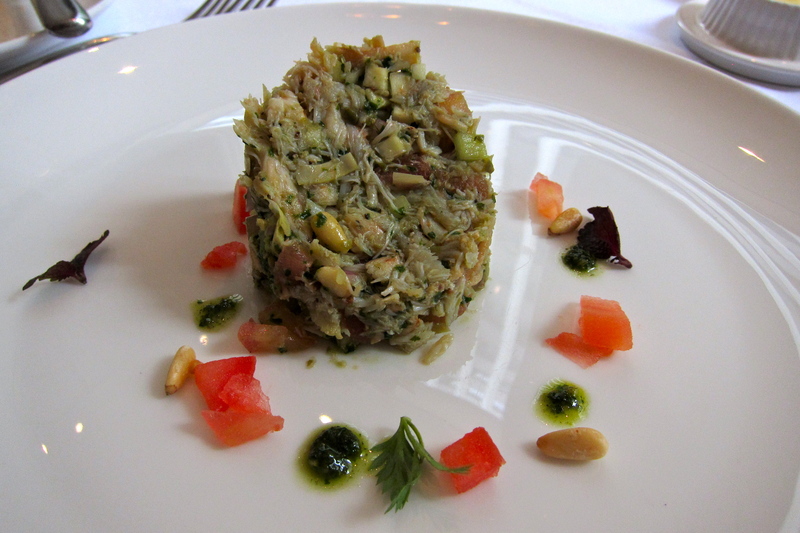 For our starters, we both chose there Crabmeat Cold ‘Cake’, with Fresh Tomato, Basil and Pine Nuts. It was a very generous portion of crab, and although we enjoyed the dish I felt that they might have gone a little easier on the basil. The pine nuts gave a nice bit of crunch. For the main course, the Pan-seared boned Quail, Confit Onions and Smoked Bacon Tartlet with Red Wine Sauce was wonderful. 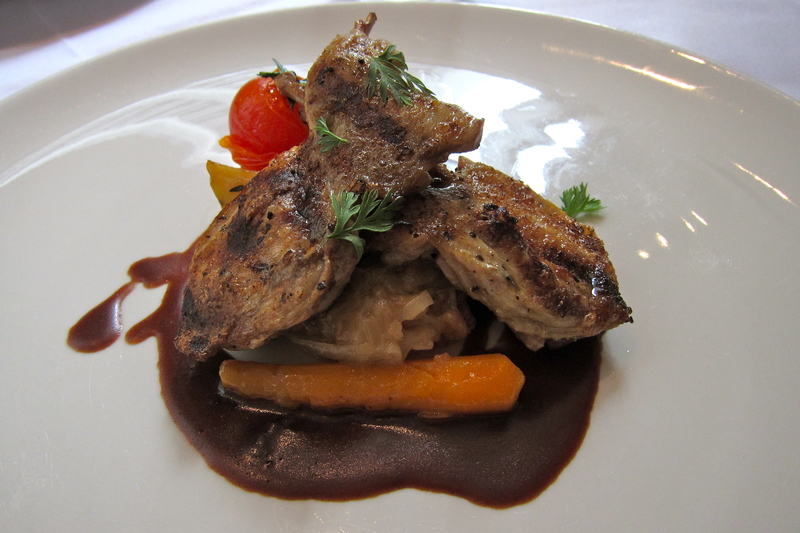 The quail was nicely cooked, and I really enjoyed the deconstructed tartlet underneath. I couldn’t remember the dish from the menu, so I asked the waiter what it was, and he told me it was choucroute – I think he’s got his French terms mixed up! A small round of crispy pastry was topped with confit onions and little pieces of smoked bacon, and finally with the quail resting on top. DW ordered the Salmon Fillet, with Red and Yellow Bell Pepper Sauce. 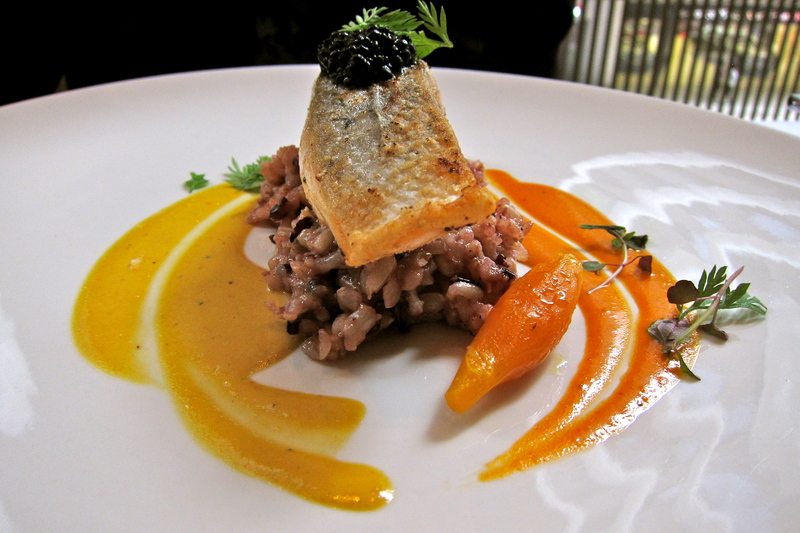 It was the most beautifully presented dish, salmon surrounded by a yin-yang of sauce, nestled on a bed of wild red rice. Where is the rice from? It’s imported from France, from the Camarague region at the end of the Rhone River, where there is more wetland, and where the rice is grown. It takes longer to cook than Asian rices, with a nutty taste and is a little more chewy in texture. It was a nice addition to the dish, and almost nicer once we knew exactly where it had been harvested! It was my mother’s birthday yesterday, so I wanted to make her a really special chocolate cake! Trouble is, I’ve never made a chocolate cake before. 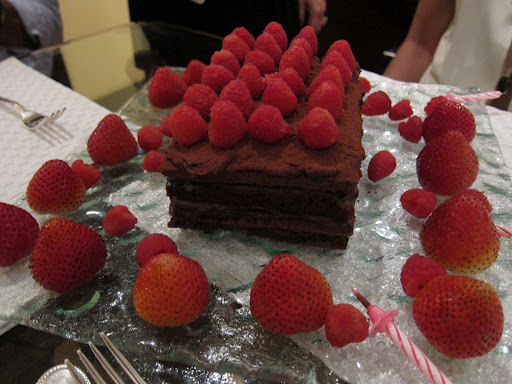 I absolutely adore the chocolate marquise cake at Starbucks…yes, I know it sounds wrong – but try it and you’ll see what I mean! It’s super sweet and has insane amounts of icing on it. Eating it by yourself is so bad but oh so good!